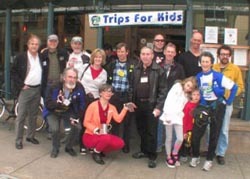 Trips for Kids' annual "Brews, Bikes and Bucks" party will be held Sunday, February 10, 2013, at the Broken Drum Brewery in San Rafael, 2-6 p.m. . Attracting famous mountain biking pioneers year after year, the "Brews, Bikes and Bucks" celebration features delicious beer, food, music and valuable raffle prizes. There is no charge for the event and Broken Drum owner, Noah Berry, will donate 100% of the beer sales to Trips for Kids. Mountain biking legends Gary Fisher, Joe Breeze, Ned Overend, Tom Ritchey, Scot Nicol, Juli Furtado, Jacquie Phelan, Otis Guy, Charles Kelly, Ross Shafer, Steve Potts, Chris Chance, Mert Lawwill, Mark Slate, Rick Sutton, Dave Garoutte and Chris Lang are all likely to attend. Trips for Kids founder Marilyn Price says, "You won't want to miss this fun event and the chance to meet so many of our local mountain bike pioneers. We're honored that by joining us they show their support of our programs." Advance raffle tickets are available at the Broken Drum and at Trips for Kids' Re-Cyclery Thrift Shop in San Rafael. Raffle tickets will also be sold at the event and ticket holders need not be present to win. The Broken Drum Brewery is located at 1132 Fourth Street, San Rafael, CA, (415) 456-4677. The Trips for Kids Re-Cyclery Bike Thrift Shop is located at 610 Fourth Street, San Rafael, Calif. The shop is open every Tuesday through Friday, 12:00 pm. to 6:00 pm. and Saturday and Sunday, 10:00 am. to 4:00 pm. For more information about the event or Trips for Kids, please visit www.tripsforkids.org/marin or call Marilyn Price at (415) 458-2986. Trips for Kids, a national 501(c)3 nonprofit, gives underserved youth a chance to experience the joy and challenge of mountain biking, while learning valuable life skills and an appreciation for the outdoors. There are currently 76 Trips for Kids chapters across the United Stated, Canada and in Israel which serve more than 16,000 deserving kids each year.